Mobile native and NBA star DeMarcus Cousins is bringing a free basketball camp to Mobile. The camp will take place at Cousins’ alma mater LeFlore Magnet High School on August 22nd and 23rd from 9:00 am until 1:00 pm with an opening ceremony at 6:00 pm on August 21st. The camp is open to boys and girls ages 6 – 15 years but is limited to the first 100 people to sign up. 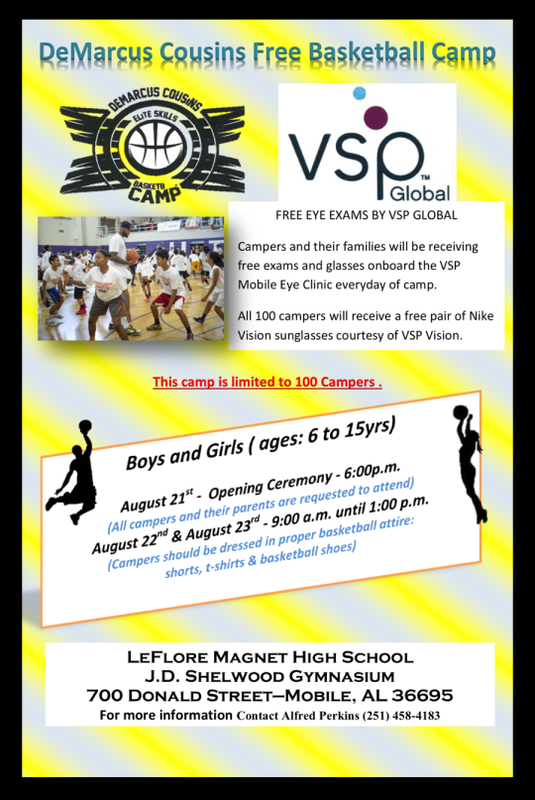 VSP Global will be offering free eye exams to campers and their families, and each camper will receive a free pair of Nike Vision sunglasses. For more information, contact Alfred Perkins at 251-458-4183.